Broadheads simply aren’t as forgiving as field points – they’re bulkier and create more resistance during flight. While we design our broadheads with superior flight characteristics in mind, virtually every bowhunter’s setup will differ, and so will the groupings. Good news is that’s easily remedied. Here are a few quick and easy bow tuning tips for fixed-blade broadheads. Not just any old arrow will do. Inspect all of them with an arrow spinner to ensure they’re straight. Any wobble means a bent shaft, which will result in inconsistent flight paths. If you’re shooting carbon arrows, check for splinters by running a rag along the shaft – any nicks will get snagged. Trash damaged arrows as they will result in poor shooting and can potentially injure you while shooting. Helical fletching is the best option for consistent flight with broadheads. Consider using a drop away rest to eliminate any contact during a shot. After you screw the broadheads on, use the spinner again to test straightness. If you notice some wobble, a crooked insert is the likely culprit. Stand 20 yards from a target and shoot a field point. Leave it in the target as a point of reference. Next, aim in the exact spot and shoot again with a broadhead-tipped arrow. How close is it to the other one? If it’s close, that’s a good sign. Repeat the process a time or two to ensure the groups are consistent. If it is, you’re good to go. 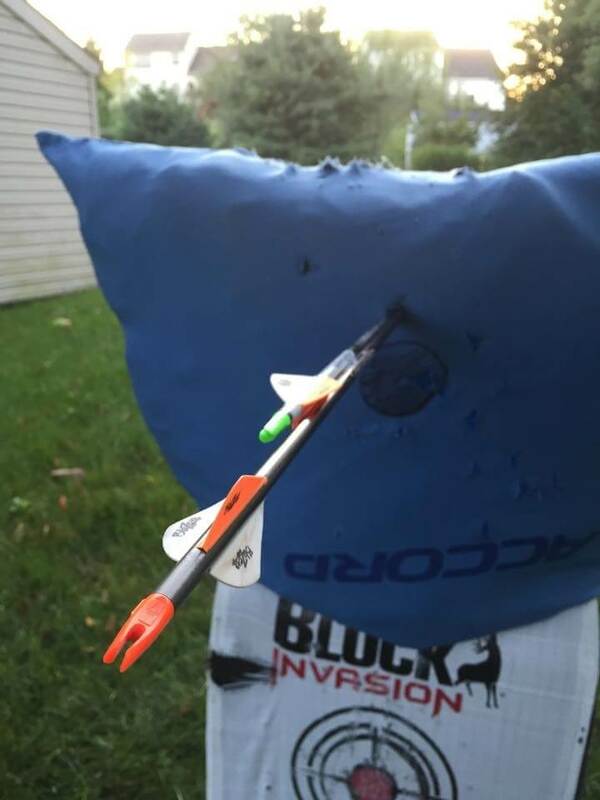 For demonstration purposes, let’s say your broadhead hit three inches higher and five inches left of the field point. That’s an indication you’ll need to tune the bow. Start by moving your rest one hash mark, usually 1/16 inch on most rests, to the right (always make rest movement opposite of where your broadhead arrow is hitting, both horizontally and vertically). Don’t move the rest vertically yet. It’s best to make one adjustment at a time because in some cases one small fix will cure the issue. Shoot both arrows again. If the fixed-blade is still too far left, you need to move the rest farther to right. If it’s now too far right, you moved it too far. Dead center but high means you need to move it down. When you start consistently hitting the same spot as the field-point-tipped arrow, you’re now dialed in. These small adjustments can spell the difference between a miss and a dead deer. Test every arrow with the broadheads you intend to use during hunting season. Take it a step further during the off season and practice from an elevated position while wearing all of your hunting clothes. Keep practice as close to real-life situations as possible and you’ll be more prepared for archery season. Choosing the best broadhead for a crossbow comes down to considering speed, arrow weight and the animal being hunted. The dedicated bow-hunter knows how to draw down on deer even when the leaf canopy no longer offers concealment.